On the director-and-producer-and-writer-and... commentary track for The Haunting in Connecticut, that gaggle of filmmakers spends a bunch of time deflecting some of the criticism swirling around their movie. It's not derivative -- it's a classic ghost story! Jump scares aren't necessarily lazy 'cause you have to be invested in the narrative or something for them to work! Our scares haven't been nicked from other horror flicks...I mean, except for the ones that are! Hey, we're character-driven too, and that makes it all that much more frightening! Look, just pick up a copy of The Changeling. No, not the weepy Angelina Jolie hey-you're-not-my-son movie from a few months back; I mean the George C. Scott film from 1980. It's everything The Haunting in Connecticut has deluded itself into thinking it is: taut, suspenseful, intensely character-driven, masterfully acted and directed, and unnerving in a very classic tradition. The Haunting in Connecticut isn't unwatchable or anything, but it's almost aggressively forgettable...as stiff and lifeless as the dusty stacks of bodies from its old mortuary. Based on a true story, The Haunting in Connecticut is about this...y'know. Haunting. In Connecticut. Matt Campbell (Kyle Gallner) has cancer, and his only hope of one day limping into his twenties is an experimental treatment at a kinda remote hospital hours and hours away. The kid's in enough pain as it is, and the day-long round trip just makes what passes for a life that much less tolerable. His mom Sara (Virginia Madsen) says no! No, God, you cannot have my darling baby boy quite yet. So, even though it puts an enormous financial strain on an already cash-strapped family, Sara grabs the other three kids and shuttles them off to a house closer to Matty's hospital. Their new digs look great, if you don't mind water damage and all that: plenty of room for the wife, sometimes-there-husband, and four kids...the price is right...it's within walking distance of the hospital...oh! And it used to be a funeral home. And the guy who lived there was a necromancer who carved all sorts of...I don't know, necromancy into his clients, sliced off their eyelids, and used what's left as a signal booster for a psychic kid (Erik J. Berg) to commune with the other side. Yeah, so you know how the rest of this goes: spooky reflections, mops sopping with blood, plates that reshelve themselves, ghosts peeking through dirty windows and popping up between big bursts of nothing, the spirits fiddling with the sell-by date on a bunch of produce, umm...swarming crabs, a nutjob lugging around an axe, some Amityville Dollhouse action... It's one thing to be a paint-by-numbers haunted house flick, but The Haunting in Connecticut is a notch below that...more like one of those Magic Pen books from Stuckey's or something. I don't even know what that means. Even with a rotting, underlit backdrop caked under inches of dust, The Haunting in Connecticut never really manages to establish much of an unnerving, unsettling tone. Rather than moving towards a pervasive sense of dread, it opts instead for jump scares punctuated by an eighteen megaton boom in the score. 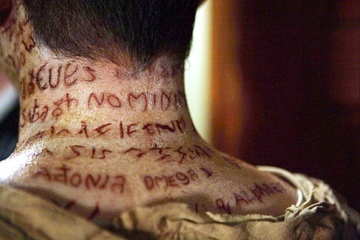 Okay, some of them work -- the design of the ghosts with unrecognizable script carved into their flesh is particularly creepy -- but the movie leans much too heavily on standard issue scares. Everytime I'd see a mirror turn up in the frame, I'd instinctively start counting down to the moment when some pan-seared corpse would pop in. What does The Haunting in Connecticut think horror ultimately boils down to? "Aaaaaaah! There's a ghost!" ::a quarter-second later:: "Aaaaaah! It's gone!" Oh, and there's the reverse: "Aaaaaaah! There's absolutely nothing in front of me! Aaaaaah! Now there's a ghost!" Sepia-toned flashbacks and timeslips, lotsa quick cutting...there's nothing all that inventive in its bag of tricks. Quite a few of the extras ramble on about how The Haunting in Connecticut is so intensely driven by its characterization, except...well, no, it's really not. There are characters, sure, but only in the same sense that the Red Shirts on Star Trek or the camp counselors in a Friday the 13th sequel are characters. I sincerely do like the cast, but the writers can't really pick out the differences between a B-plot and characterization. Matt has cancer but not a personality. His mom Sara is one of those fist-clenched "ooooooh, I'm gonna fight for my kids!" types, but what does she do other than...well, fight for her kids? Nothing. The only character trait Wendy (yay! Amanda Crew) is really given is that she's trying to thumb through a book between chasing down screaming family members, although I guess she does take the reins as babysitter and play hide-and-seek with the two completely interchangeable moppets too. No one has any semblance of a personality at all, really, defined completely by what the plot orders them to do. Thin characterization is alright if there's something else to distract me, but with weak scares and a parade of cardboard cutouts, the movie didn't leave me with much of anything to latch onto. 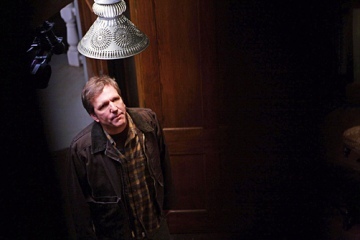 The Haunting in Connecticut wastes a lot of time with an alcoholism subplot that ultimately amounts to nothing, and the money woes are another ploy for sympathy and an attempt at explaining away why the family doesn't just hole up in a hotel room. I was ready to forgive the movie for spending so much time pretending that these are all just hallucinations brought on by Matt's next-gen chemotherapy -- sure, I can fanwank the plot's need for that away -- but one of the audio commentaries makes a big deal about the need to establish the possibility of doubt. C'mon, there's a kid spitting up a [email protected]$ing ghost on the cover! We know these aren't just ghouls bumping around in his head, and this is why they cut pretty much all that same sort of crap out of The Exorcist. Just because the characters haven't caught any of the TV spots doesn't mean we haven't. The whole thing's really slow moving, and there are several scenes -- hey, how about another round of hide-and-seek? -- that wind up being chucked in the microwave to be unnecessarily rehashed again almost verbatim. Don't get me wrong: The Haunting in Connecticut isn't unredeemably awful or anything like that. I really do like the cast, even though they're kind of squandered straight across the board. First-time feature film director Peter Cornwell too readily settles for the familiar but has a reasonably stylish visual eye. Here's the thing, though: in the extras, one of the producers (or whoever it is) defends the theatrical release's PG-13 rating and quotes a review saying how this is the perfect horror flick for a barely-pubescent teenage girl. I guess that's the target demo because if you've caught Poltergeist, The Exorcist, The Shining, or...well, pretty much anything else, ever, the smart money says you've seen this all before and a heckuva lot better to boot. If the voices in your head are still compelling you to seek out The Haunting in Connecticut, I'd say Rent It. For what it's worth, this Blu-ray disc does serve up two versions of the flick: the PG-13 cut that made the rounds theatrically and a grislier unrated version. The differences include more graphic imagery with the corpses, including an eyelid being carved off, restoring some colors that had been dialed down to slink past the MPAA, and more of those incantations carved into their fleshy canvases. The Haunting in Connecticut looks kind of erratic in high-def. Some scenes are startingly crisp, clean, and detailed. Contrast flattens out in others, saddled with a softer appearance and awash in grain. I think a gritty texture can effectively establish the tone for this sort of film, but the inconsistency here can be distracting. Still, this Blu-ray disc is culled directly from the movie's digital intermediate, so there aren't any missteps here that weren't around during its theatrical run. The scope image frequently does look fantastic, though, and the AVC encode never buckles under the weight of the crisply-rendered grain or the strobing photography. The Haunting in Connecticut leans heavily on its hyperaggressive sound design to try and unsettle the audience, and this 24-bit, 7.1 DTS-HD Master Audio soundtrack snarls with ferocity. The mix summons a hellish low-end from the subwoofer, and the bulk of the scares are reinforced by thunderous, violent waves of bass. There's a consistently robust sense of directionality, even in something as seemingly low-key as a "For Rent" sign being hammered into the ground, and creaking wood, ominous footsteps, flapping wings, and...um, attacking waves of letters immersively swarm from every direction. Its dialogue is consistently rendered cleanly and clearly throughout, never dominated in the mix even with as chaotic and disorienting as things can get. This is another in a long line of outstanding lossless soundtracks from Lionsgate and solid demo material if you want to show off just what Blu-ray can hammer out. The PG-13 version of the flick also serves up a Dolby Digital 5.1 dub in French. Subtitles are offered in English (traditional and SDH) and Spanish. Audio Commentaries: The Haunting in Connecticut belts out two audio commentaries for the unrated version of the film. The first of 'em is a little more technically oriented, featuring director Peter Cornwell, producer Andy Trapani, screenwriter Adam Simon, and editor Tom Elkins. It's a pretty personable track that spends quite a bit of time on the construction of the story and defending criticism from reviewers. If you give it a spin, stick around through the end credits; most of the notes about how it all came together aren't delivered until then. Cornwell sits down again with actors Virginia Madsen and Kyle Gallner for a commentary recorded partially in Bela Lugosi's old digs. It's really giggly but...hey! educational too. I learned that Gallner can make himself retch on command, that Madsen was saddled with a ponch in the early days of the shoot until hitting up a yoga class, that maggots count as animals too, and that a psychic clued Madsen into an otherworldly portal next to her old house. There are quite a few stories about the ghost makeup -- from Easter Eggs hidden in the carved incantations to one extra going a couple of days with it stuck on -- and the whole thing's just a really fun, breezy listen. Two Dead Boys: The Making of The Haunting in Connecticut (15 min. ; primarily SD): Although this making-of featurette is encoded in high-def, only the snippets from the movie are natively HD. The interviews and behind-the-scenes footage are all low-res, distractingly interlaced video. On the upside, even though "Two Dead Boys" is kind of cursory, at least it's not the usual sort of puff piece...way too many spoilers lobbed around in here for that. Among the highlights are bringing the reluctant family behind this true story onboard, chatter about the appeal of character-driven horror, the sense of community on the set, the production design behind the mortuary backdrop, the elaborate make-up effects, and some of the spo-o-o-o-o-oky goings-on throughout the shoot. Memento Mori: The History of Post-Mortem Photography (11 min. ; HD): This particularly intriguing featurette doesn't just delve into post-mortem photography -- the once-widespread practice of immortalizing loved ones after they'd passed on -- but explores contrasting societal perceptions of death over the past couple of centuries. It casts a considerably wider net than its title suggests, also touching on the ectoplasmic photography that also plays a role in the film. Anatomy of a Haunting (12 min. ; HD): Featurette Numero Two-Oh kicks off by working in an analogy between a DVD player and chatting up the dead, so there's that. "Anatomy of a Haunting" focuses on investigations into these sorts of phenomena, including the incident that inspired The Entity, and a number of spectral photos are scattered around in here too. The investigators also take the time to speak about their reactions to The Haunting in Connecticut in particular. The Fear is Real: Reinvestigating the Haunting (42 min. ; HD): This retrospective catches up with several members of the Snedeker family who -- alongside some of their one-time-friends and neighbors -- tell the story of the haunting in their own words. Their version is at least in some ways more wild than what made it into the movie, although curiously, no one mentions arson or defiled corpses. One of the ghosts was reportedly pretty chatty, others were kids that'd trash the family's toys...I dunno, I guess I'd rather watch that than just another impersonal barrage of finger-waggling evil. Oh! But to veer back over to "The Fear is Real", there are also sketches of the demons the kids drew twentysomething years ago, vintage news reports, and a visit with what's left of the Warren family that investigated the haunting. The Snedekers also talk about the backlash that came with bringing the haunting public (another angle that didn't find its way into the flick), and the featurette makes an effort to be even-keeled about skepticism, although the author of the highly-critical book In a Dark Place declining to be interviewed kind of throttles that angle. There's also a kinda spooky coincidence with a crucifix at one point too. I really dug all three of these high-def featurettes, and I definitely find myself preferring extras that use the movie as a springboard the way these do. Deleted Scenes (9 min. ; SD): Six deleted scenes have been piled on here, each with optional commentary by director Peter Cornwell. They're mostly scare scenes too, although there's nothing all that memorable: Wendy and Matt skulking around in a graveyard, a peek at Rev. Popescu's old church, catching up with Sara at work before waltzing into a slightly burning house, Matt playing an unhinged game of catch with his kid brother, more Amityville Dollhouse, and a Magic 8 Ball from Hell. Trailers (HD): Also tacked on are a few high-def trailers, including one for The Haunting in Connecticut. Digital Copy: A second disc serves up a digital copy of the movie for use on iTunes and Windows Media-powered devices. Okay, I obviously wasn't around when all of the different drafts for The Haunting in Connecticut were being hammered out, but I'm guessing the writing process went something like this. Dull. Derivative. Really just an excuse to string together a bunch of paint-by-numbers "boo!" jump scares. Rent It.